Produktinformationen "Petroglyphs of Cheonjeon-ri in Ulsan, - Mängelexemplar"
The Cheonjeon-ri Petroglyphs in Ulsan are unique as prehistoric petroglyphs, historic period fine-line engravings, and inscribed texts are displayed on the same panel. 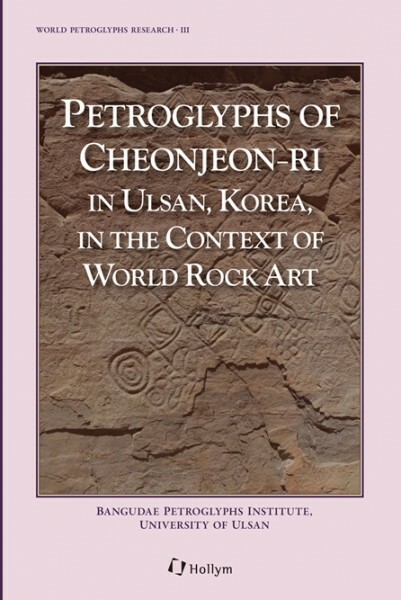 The Bangudae Petroglyphs Institute of University of Ulsan has been publishing its annual English publication series, World Petroglyphs Research, and this year’s issue is on the Cheonjeon-ri Petroglyphs. Nine authors, including archaeologists, art historians, and historians from Europe, the US, and Korea, contributed chapters to the book. These chapters either discuss the petroglyphs or texts of the Cheonjeon-ri in various angles or help to see the site within a broader context of the world’s rock art. An eminent scholar on petroglyphs, Emmanuel Anati (CISPE) presented that prehistoric art may have various functions, educational images for next generation, recording and memorization of myths, and more. Henri-Paul Francfort (CNRS) analyzed the Cheonjeon-ri Petroglyphs on art historical view. Esther Jacobson-Tepfer (Univ. of Oregon) evaluated that Cheonjeon-ri Petroglyphs are highly unusual and unique within rock art sites of North Asia. Jong-il Kim (Seoul National Univ.) introduced the current situation of rock art studies and analyzed its symbolic and social meaning within its placement and landscape. Gwon-gu Kim (Keimyung Univ.) studied symbolic meanings of the prehistoric designs on the Cheonjeon-ri Petroglyphs. Hotae Jeon (Univ. of Ulsan) emphasized that the dragon of the Cheonjeon-ri Petroglyphs is a representative figure as a historic document on the beliefs of the Silla people. Jonghoon-Kang (Catholic Univ. of Daegu) examined some new and revised readings of the textual inscriptions on the Cheonjeon-ri Petroglyphs. Myeong-su Jang (Seokyeong Cultural Properties Research Institute) categorized the religious images based on their themes, and studied the symbolism to identify the religious consciousness and the ceremonial system in Cheonjeon-ri Petroglyphs. Hawoo Rhee (Bangudae Petroglyphs Institute) examined a significant cultural exchange between Korean rock engravings and Siberian culture through deer images in Cheonjeon-ri. The petroglyph sites in the world are perhaps the most valuable material in understanding the religious faith and the world view of prehistoric people. The Cheonjeon-ri Petroglyphs suggest many aspects of the Neolithic and Bronze Age culture in the Korean peninsula. In addition, the texts are historic and religious testimony as well as cultural and artistic records left by royals, nobles, and monks of the Silla Kingdom. This book will be recognized as meaningful and valuable material for Korean prehistory and history researchers. Weiterführende Links zu "Petroglyphs of Cheonjeon-ri in Ulsan, - Mängelexemplar"
Unser Kommentar zu "Petroglyphs of Cheonjeon-ri in Ulsan, - Mängelexemplar"
Kundenbewertungen für "Petroglyphs of Cheonjeon-ri in Ulsan, - Mängelexemplar"